Academic articles (as historically seen in print-based academic journals) have been the main focus of the movement. Conventional (non-open access) journals cover publishing costs through access tolls such as subscriptions, site licenses or pay-per-view charges. Open access can be applied to all forms of published research output, including peer-reviewed and non peer-reviewed academic journal articles, conference papers, theses, book chapters, and monographs. The number and proportion of open access articles split between Gold, Green, Hybrid, Bronze and closed access (from 1950 - 2016). Ratios of article access types for different subjects (averaged 2009 - 2015). Number of Gold open access journals listed in the Directory of Open Access Journals. Number of Gold and Hybrid open access journals listed in PubMed Central. Number of open access repositories listed in the Registry of Open Access Repositories. Various studies have investigated the extent of open access. A study published in 2010 showed that roughly 20% of the total number of peer-reviewed articles published in 2008 could be found openly accessible. Another study found that by 2010, 7.9% of all academic journals with impact factors were gold open access journals and showed a broad distribution of Gold Open Access journals throughout academic disciplines. A study of random journals from the citations indexes AHSCI, SCI and SSCI in 2013 came to the result that 88% of the journals were closed access and 12% were open access. In August 2013, a study done for the European Commission reported that 50% of a random sample of all articles published in 2011 as indexed by Scopus were freely accessible online by the end of 2012. A 2017 study by the Max Planck Society put the share of gold access articles in pure open access journals at around 13 percent of total research papers. In 2009, there were approximately 4,800 active open access journals, publishing around 190,000 articles. As of February 2019, over 12,500 open access journals are listed in the Directory of Open Access Journals. 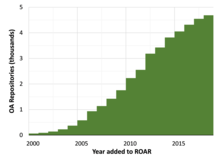 The Registry of Open Access Repositories (ROAR) indexes the creation, location and growth of open access open access repositories and their contents. As of February 2019, over 4,500 institutional and cross-institutional repositories have been registered in ROAR. Open access journals ('gold' open access): The publisher of the journal makes all articles and related content available for free on the journal's website. Self-archiving ('green' open access): After peer review by a journal, the author posts the same content the journal will be publishing to a website controlled by the author, the research institution that funded or hosted the work, or which has been set up as a central open access repository. Advantages and disadvantages of open access have generated considerable discussion amongst researchers, academics, librarians, university administrators, funding agencies, government officials, commercial publishers, editorial staff and society publishers. Reactions of existing publishers to open access journal publishing have ranged from moving with enthusiasm to a new open access business model, to experiments with providing as much free or open access as possible, to active lobbying against open access proposals. There are many publishers that started up as open access-only publishers, such as PLOS, Hindawi Publishing Corporation, Frontiers in... journals, MDPI and BioMed Central. In order to reflect actual practice in providing two different types of open access, the further distinction between gratis open access and libre open access was added in 2006 by the principal drafter of the original BOAI definition. Gratis open access refers to online access free of charge, and libre open access refers to online access free of charge plus some additional re-use rights. Libre open access covers the kinds of open access defined in the Budapest Open Access Initiative, the Bethesda Statement on Open Access Publishing and the Berlin Declaration on Open Access to Knowledge in the Sciences and Humanities. 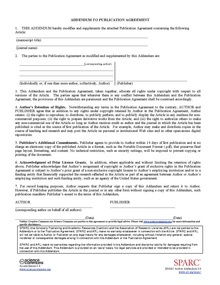 The re-use rights of libre OA are often specified by various specific Creative Commons licenses; almost all of these require attribution of authorship to the original authors. One option for authors who wish to make their work openly accessible is to publish in a journal or book that makes research output immediately available from the publisher. This is sometimes referred to as gold open access. In one model of open access, journals generate revenue by charging publication fees in order to make the work openly available at the time of publication. The money might come from the author but more often comes from the author's research grant or employer. Some publishers will waive all or part of the fee for authors from less developed economies. Journals charging publication fees normally take various steps to ensure that peer reviewers do not know whether authors have requested, or been granted, fee waivers, or to ensure that every paper is approved by an independent editor with no financial stake in the journal. While the payments are often incurred per article published (e.g. BMC journals or PLOS ONE), there are some journals that apply them per manuscript submitted (e.g. Atmospheric Chemistry and Physics until recently) or per author (e.g. PeerJ). 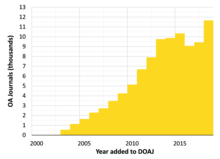 As of June 2018, only 26% of journals in the Directory of Open Access Journals (DOAJ) required payment of article processing charges. A 2013 study showed this practice was higher in journals with a scientific or medical focus (43% and 47% respectively), and lowest in journals publishing in the arts and humanities (0% and 4% respectively). Traditionally, many academic journals levied page charges, long before open access became a possibility. There currently is a growing global debate regarding open access's ideology and ethics and its related article processing charges, as they are being created and managed by academic journal and monograph publisher conglomerates together with some national and international academic institutions and government bodies. One controversy is "double dipping", where both authors and subscribers are charged. No-fee open access journals, also known as "platinum" or "diamond" have no fees for readers and no article processing charges or publication fees for authors. They use a variety of business models. As summarized by Peter Suber: "Some no-fee OA journals have direct or indirect subsidies from institutions like universities, laboratories, research centers, libraries, hospitals, museums, learned societies, foundations, or government agencies. Some have revenue from a separate line of non-OA publications. Some have revenue from advertising, auxiliary services, membership dues, endowments, reprints, or a print or premium edition. Some rely, more than other journals, on volunteerism. Some undoubtedly use a combination of these means". Open access monographs are subsidized through a variety of means as well. Knowledge Unlatched and unglue.it crowdsource funding in order to make a work available open access. Like the self-archived green open access articles, most gold open access journal articles are distributed via the World Wide Web, due to low distribution costs, increasing reach, speed, and increasing importance for scholarly communication. Open source software is sometimes used for open access repositories, open access journal websites, and other aspects of open access provision and open access publishing. Access to online content requires Internet access, and this distributional consideration presents physical and sometimes financial barriers to access. There are various open access aggregators that list open access journals or articles. ROAD (the Directory of Open Access scholarly Resources) synthesizes information about open access journals and is a subset of the ISSN register. SHERPA/RoMEO lists international publishers that allow the published version of articles to be deposited in institutional repositories. The Directory of Open Access Journals (DOAJ) contains over 12,500 peer-reviewed open access journals for searching and browsing. Open access articles can be found with a web search, using any general search engine or those specialized for the scholarly and scientific literature, such as Google Scholar, OAIster, openaccess.xyz, base-search.net, and CORE Many open-access repositories offer a programmable interface to query their content. Some of them use a generic protocol, such as OAI-PMH (e.g., base-search.net). In addition, some repositories propose a specific API, such as the arXiv API, the Dissemin API, the Unpaywall/oadoi API, or the base-search API. Several initiatives provide an alternative to the English language dominance of existing publication indexing systems, including Index Copernicus (Polish), SciELO (Portuguese, Spanish) and Redalyc (Spanish). Many universities, research institutions and research funders have adopted mandates requiring their researchers to make their research publications open access. For example, Research Councils UK spent nearly £60m on supporting their open access mandate between 2013 and 2016. The idea of mandating self-archiving was mooted at least as early as 1998. Since 2003 efforts have been focused on open access mandating by the funders of research: governments, research funding agencies, and universities. Some publishers and publisher associations have lobbied against introducing mandates. The Registry of Open Access Repository Mandates and Policies (ROARMAP) is a searchable international database charting the growth of open access mandates. As of February 2019, mandates have been registered by over 700 universities (including Harvard, MIT, Stanford, University College London, and University of Edinburgh) and over 100 research funders worldwide. Open access (mostly green and gratis) began to be sought and provided worldwide by researchers when the possibility itself was opened by the advent of Internet and the World Wide Web. The momentum was further increased by a growing movement for academic journal publishing reform, and with it gold and libre OA. An obvious advantage of open access journals is the free access to scientific papers regardless of affiliation with a subscribing library and improved access for the general public; this is especially true in developing countries. Lower costs for research in academia and industry have been claimed in the Budapest Open Access Initiative, although others have argued that OA may raise the total cost of publication, and further increase economic incentives for exploitation in academic publishing. The open access movement is motivated by the problems of social inequality caused by restricting access to academic research, which favor large and wealthy institutions with the financial means to purchase access to many journals, as well as the economic challenges and perceived unsustainability of academic publishing. Two major studies dispute the claim that open access articles lead to more citations. A randomized controlled trial of open access publishing involving 36 participating journals in the sciences, social sciences, and humanities found that open access articles (n=712) received significantly more downloads and reached a broader audience within the first year, yet were cited no more frequently, nor earlier, than subscription-access control articles (n=2533) within 3 years. Many other studies, both major and minor and with varying degrees of methodological rigor, find that an open access article is more likely to be used and cited than one behind subscription barriers. For example, a 2006 study in PLoS Biology found that articles published as immediate open access in PNAS were three times more likely to be cited than non-open access papers, and were also cited more than PNAS articles that were only self-archived. This result has been challenged as an artifact of authors self-selectively paying to publish their higher quality articles in hybrid open access journals, whereas a 2010 study found that the open access citation advantage was equally big whether self-archiving was self-selected or mandated. A 2010 study of 27,197 articles in 1,984 journals used institutionally mandated open access instead of randomized open access to control for bias on the part of authors toward self-selectively making their better (hence more citeable) articles open access. The result was a replication of the repeatedly reported open access citation advantage, with the advantage being equal in size and significance whether the open access was self-selected or mandated. Scholars are paid by research funders and/or their universities to do research; the published article is the report of the work they have done, rather than an item for commercial gain. The more the article is used, cited, applied and built upon, the better for research as well as for the researcher's career. Open access can reduce publication delays, an obstacle which led some research fields such as high-energy physics to adopt widespread preprint access. Some professional organizations have encouraged use of open access: in 2001, the International Mathematical Union communicated to its members that "Open access to the mathematical literature is an important goal" and encouraged them to "[make] available electronically as much of our own work as feasible" to "[enlarge] the reservoir of freely available primary mathematical material, particularly helping scientists working without adequate library access". Research funding agencies and universities want to ensure that the research they fund and support in various ways has the greatest possible research impact. As a means of achieving this, research funders are beginning to expect open access to the research they support. Many of them (including all UK Research Councils) have already adopted open access mandates, and others are on the way to do so (see ROARMAP). In the US, the 2008 NIH Public Access Policy, an open access mandate was put into law, and required that research papers describing research funded by the National Institutes of Health must be available to the public free through PubMed Central (PMC) within 12 months of publication. In May 2005, 16 major Dutch universities cooperatively launched DAREnet, the Digital Academic Repositories, making over 47,000 research papers available. From 2 June 2008, DAREnet has been incorporated into the scholarly portal NARCIS. By 2019, NARCIS provided access to 360,000 open access publications from all Dutch universities, KNAW, NWO and a number of scientific institutes. In 2011, a group of universities in North America formed the Coalition of Open Access Policy Institutions (COAPI). Starting with 21 institutions where the faculty had either established an open access policy or were in the process of implementing one, COAPI now has nearly 50 members. These institutions' administrators, faculty and librarians, and staff support the international work of the Coalition's awareness-raising and advocacy for open access. In 2012, the Harvard Open Access Project released its guide to good practices for university open-access policies, focusing on rights-retention policies that allow universities to distribute faculty research without seeking permission from publishers. Rights retention is currently being explored in the UK by UKSCL. In 2013 a group of nine Australian universities formed the Australian Open Access Support Group (AOASG) to advocate, collaborate, raise awareness, and lead and build capacity in the open access space in Australia. In 2015, the group expanded to include all eight New Zealand universities and was renamed the Australasian Open Access Support Group. It was then renamed the Australasian Open Access Strategy Group, highlighting its emphasis on strategy. The awareness raising activities of the AOASG include presentations, workshops, blogs, and a webinar series on open access issues. As information professionals, librarians are often vocal and active advocates of open access. These librarians believe that open access promises to remove both the price barriers and the permission barriers that undermine library efforts to provide access to the scholarly record, as well as helping to address the serials crisis. Many library associations have either signed major open access declarations, or created their own. For example, IFLA have produced a Statement on Open Access. Many open access projects involve international collaboration. For example, the SciELO (Scientific Electronic Library Online), is a comprehensive approach to full open access journal publishing, involving a number of Latin American countries. Bioline International, a non-profit organization dedicated to helping publishers in developing countries is a collaboration of people in the UK, Canada, and Brazil; the Bioline International Software is used around the world. Research Papers in Economics (RePEc), is a collaborative effort of over 100 volunteers in 45 countries. The Public Knowledge Project in Canada developed the open-source publishing software Open Journal Systems (OJS), which is now in use around the world, for example by the African Journals Online group, and one of the most active development groups is Portuguese. This international perspective has resulted in advocacy for the development of open-source appropriate technology and the necessary open access to relevant information for sustainable development. The main argument against open access, author's paid fee based journals, is the possible damage to the peer review system, diminishing the overall quality of scientific journal publishing. For example, in 2009, a hoax paper generated by a computer program was accepted for publication by a major publisher under the author-pays-for-publication model. In a similar incident, a staff writer for Science magazine and popular science publications targeted the open access system in 2013 by submitting to some such journals a deeply flawed paper on the purported effect of a lichen constituent. About 60% of those journals, including journals published by the major academic publishers Sage Publications and Elsevier the Journal of Natural Pharmaceuticals, accepted the faked medical paper. However, journals published by notable open access publishers PLOS, BioMed Central, and Hindawi Publishing Corporation rejected the fake article. In addition, the faked paper was not published in subscription journals as a control. As a result, this experiment was criticized for using a flawed methodology and not including a control group. Many newer open access journals also lack the reputation of their subscription counterparts, which have been in business for decades. 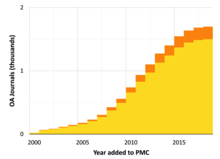 This effect has been diminishing though since 2001, reflecting the emergence of high quality professional open access publishers such as PLOS and BioMed Central. Multiple databases exist for open access articles, journals and datasets. These databases overlap, however each has different inclusion criteria, which typically include extensive vetting for journal publication practices, editorial boards and ethics statements. The main databases of open access articles and journals are DOAJ and PMC. In the case of DOAJ, only fully gold open access journals are included, whereas PMC also hosts articles from hybrid journals. There are also a number of preprint servers which host articles that have not yet been reviewed as open access copies. These articles are subsequently submitted for peer review by both open access or subsbscription journals, however the preprint always remains openly accessible. A list of preprint servers is maintained at ResearchPreprints. For articles that are published in closed access journals, some authors will deposit a postprint copy in an open access repository, where it can be accessed for free. Most subscription journals place restrictions on which version of the work may be shared and/or require an embargo period following the original date of publication. What is deposited can therefore vary, either a preprint or the peer-reviewed postprint, either the author's refereed and revised final draft or the publisher's version of record, either immediately deposited or after several years. Repositories may be specific to an institution, a discipline (e.g.arXiv), a scholarly society (e.g. MLA's CORE Repository), or a funder (e.g. PMC). Although the practice was first formally proposed in 1994, self-archiving was already being practiced by some computer scientists in local FTP archives in the 1980s (later harvested by CiteSeer). The SHERPA/RoMEO site maintains a list of the different publisher copyright and self-archiving policies and the ROAR database hosts an index of the repositories themselves. ^ a b c d e Suber, Peter. "Open Access Overview". Archived from the original on 2017-05-19. Retrieved 29 November 2014. ^ Schöpfel, Joachim; Prost, Hélène (2013). "Degrees of secrecy in an open environment. The case of electronic theses and dissertations". ESSACHESS – Journal for Communication Studies. 6 (2(12)): 65–86. Archived from the original on 2014-01-01. ^ Schwartz, Meredith (2012). "Directory of Open Access Books Goes Live". Library Journal. Archived from the original on October 4, 2013. ^ a b Piwowar, Heather; Priem, Jason; Larivière, Vincent; Alperin, Juan Pablo; Matthias, Lisa; Norlander, Bree; Farley, Ashley; West, Jevin; Haustein, Stefanie (2018-02-13). "The state of OA: a large-scale analysis of the prevalence and impact of Open Access articles". PeerJ. 6: e4375. doi:10.7717/peerj.4375. ISSN 2167-8359. PMC 5815332. PMID 29456894. ^ "DOAJ: Directory of Open Access Journals". doaj.org. 2013-05-01. Archived from the original on 2019-03-10. ^ Morrison, Heather (2018-12-31). "Dramatic Growth of Open Access". Scholars Portal Dataverse. ^ "PMC full journal list download". www.ncbi.nlm.nih.gov. Retrieved 2019-03-10. ^ "NLM Catalog". www.ncbi.nlm.nih.gov. Retrieved 2019-03-10. ^ "Browse by Year". roar.eprints.org. Registry of Open Access Repositories. Retrieved 2019-03-10. ^ Björk, B. C.; Welling, P.; Laakso, M.; Majlender, P.; Hedlund, T.; Guðnason, G. N. (2010). Scalas, Enrico (ed.). "Open Access to the Scientific Journal Literature: Situation 2009". PLoS ONE. 5 (6): e11273. Bibcode:2010PLoSO...511273B. doi:10.1371/journal.pone.0011273. PMC 2890572. PMID 20585653. ^ Cummings, J. (2013). "Open access journal content found in commercial full-text aggregation databases and journal citation reports". New Library World. 114 (3/4): 166–178. doi:10.1108/03074801311304078. ^ a b c d Fuchs, Christian; Sandoval, Marisol (2013). "The diamond model of open access publishing: Why policy makers, scholars, universities, libraries, labour unions and the publishing world need to take non-commercial, non-profit open access serious". TripleC. 13 (2): 428–443. doi:10.31269/triplec.v11i2.502. ^ "Open access to research publications reaching 'tipping point'". Press Releases. europa.eu. Archived from the original on 2013-08-24. Retrieved 2013-08-25. ^ "Proportion of Open Access Peer-Reviewed Papers at the European and World Levels—2004–2011" (PDF). Science-Metrix. August 2013. Archived (PDF) from the original on 2013-09-03. Retrieved 2013-08-25. ^ Van Noorden, Richard (2013). "Half of 2011 papers now free to read". Nature. 500 (7463): 386–7. Bibcode:2013Natur.500..386V. doi:10.1038/500386a. PMID 23969438. ^ "Area-wide transition to open access is possible: A new study calculates a redeployment of funds in Open Access". www.mpg.de/en. Max Planck Gesellschaft. 27 April 2015. Archived from the original on 16 June 2017. Retrieved 2017-05-12. ^ Björk, Bo-Christer (2011). "A Study of Innovative Features in Scholarly Open Access Journals". Journal of Medical Internet Research. 13 (4): e115. doi:10.2196/jmir.1802. PMC 3278101. PMID 22173122. ^ "Directory of Open Access Journals". Directory of Open Access Journals. Retrieved 26 February 2019. ^ "Registry of Open Access Repositories (ROAR)" Archived 2012-10-30 at the Wayback Machine. Roar.eprints.org. Retrieved on 2011-12-03. ^ "Browse by Repository Type". Registry of Open Access Repositories. Retrieved 26 February 2019. ^ Markin, Pablo (25 April 2017). "The Sustainability of Open Access Publishing Models Past a Tipping Point". OpenScience. Retrieved 26 April 2017. ^ a b c Suber, Peter (2008). "Gratis and Libre Open Access". Retrieved 2011-12-03. ^ Harnad, S; Brody, T; Vallières, F; Carr, L; Hitchcock, S; Gingras, Y; Oppenheim, C; Hajjem, C; Hilf, E (2008). "The Access/Impact Problem and the Green and Gold Roads to Open Access: An Update" (PDF). Serials Review. 34: 36–40. doi:10.1016/j.serrev.2007.12.005. ^ "OA journal business models". Open Access Directory. 2009–2012. Archived from the original on 2015-10-18. Retrieved 2015-10-20. ^ Machovec, George (2013). "An Interview with Jeffrey Beall on Open Access Publishing". The Charleston Advisor. 15: 50. doi:10.5260/chara.15.1.50. ^ Öchsner, A. (2013). "Publishing Companies, Publishing Fees, and Open Access Journals". Introduction to Scientific Publishing. SpringerBriefs in Applied Sciences and Technology. pp. 23–29. doi:10.1007/978-3-642-38646-6_4. ISBN 978-3-642-38645-9. ^ a b c Gajović, S (31 August 2017). "Diamond Open Access in the quest for interdisciplinarity and excellence". Croatian Medical Journal. 58 (4): 261–262. doi:10.3325/cmj.2017.58.261. PMC 5577648. PMID 28857518. ^ Harris, Siân (August 2012). "Moving towards an open access future: the role of academic libraries" (PDF). Sage Publications. Retrieved 2018-03-16. ^ Socha, Beata (20 April 2017). "How Much Do Top Publishers Charge for Open Access?". openscience.com. Retrieved 26 April 2017. ^ Peter, Suber (2012). Open access. Cambridge, Massachusetts: MIT Press. ISBN 9780262301732. OCLC 795846161. ^ Kozak, Marcin; Hartley, James (Dec 2013). "Publication fees for open access journals: Different disciplines-different methods". Journal of the American Society for Information Science and Technology. 64 (12): 2591–2594. doi:10.1002/asi.22972. ^ Myers, Greg (2003-11-01). "Alan G. Gross, Joseph E. Harmon, and Michael Reidy, Communicating Science: The Scientific Article from the Seventeenth Century to the Present. Oxford: Oxford University Press, 2002". Metascience. 12 (3): 374–377. doi:10.1023/B:MESC.0000005867.76966.dc. ISSN 1467-9981. ^ Kember, Sarah. "Opening Out from Open Access: Writing and Publishing in Response to Neoliberalism". ADANewMedia. Retrieved 12 March 2018. ^ Kember, Sarah. "How Open is Open Access?". The Bookseller. Retrieved 12 March 2018. ^ Page, Benedicte. "Angry publishers debate OA monographs at IPG". The Bookseller. Retrieved 12 March 2018. ^ INASP. "Publishers for Development". Publishers for Development. Retrieved 12 March 2018. ^ "Research4Life". Retrieved 12 March 2018. ^ "Open access double dipping policy". Cambridge Core. ^ Koroso, Nesru H. (18 November 2015). "Diamond Open Access - UA Magazine". UA Magazine. ^ Suber, Peter (November 2, 2006). "No-fee open-access journals". SPARC open access Newsletter. ^ Montgomery, Lucy (2014). "Knowledge Unlatched:A Global Library Consortium Model for Funding Open Access Scholarly Books". Cultural Science. 7 (2). hdl:20.500.11937/12680. ^ "About unglue.it". unglue.it. Retrieved 10 June 2018. ^ Budapest Open Access Initiative, FAQ Archived 2006-07-03 at the Wayback Machine. Earlham.edu (2011-09-13). Retrieved on 2011-12-03. ^ Public Knowledge Project. "Open Journal Systems" Archived 2013-03-01 at the Wayback Machine. Retrieved on 2012-11-13. ^ "Welcome - ROAD". road.issn.org. ^ Martin, Greg. "Research Guides: Open Access: Finding Open Access Content". mcphs.libguides.com. ^ Edgar, Brian D.; Willinsky, John (14 June 2010). "A survey of scholarly journals using open journal systems". Scholarly and Research Communication. 1 (2). ISSN 1923-0702. ^ "RCUK Open Access Block Grant analysis - Research Councils UK". www.rcuk.ac.uk. Retrieved 2018-02-12. ^ American-Scientist-Open-Access-Forum: Re: Savings from Convertin Archived 2005-12-10 at the Wayback Machine. Ecs.soton.ac.uk. Retrieved on 2011-12-03. ^ AMERICAN-SCIENTIST-OPEN-ACCESS-FORUM archives – 2003 (#710) Archived 2007-01-11 at the Wayback Machine. Listserver.sigmaxi.org. Retrieved on 2011-12-03. ^ Recommendations For Uk Open-Access Provision Policy Archived 2006-01-07 at the Wayback Machine. Ecs.soton.ac.uk (1998-11-05). Retrieved on 2011-12-03. ^ "Open Access". RCUK. Archived from the original on 26 December 2015. Retrieved 19 December 2015. ^ About the Repository – ROARMAP. Roarmap.eprints.org. Retrieved on 2011-12-03. ^ Palazzo, Alex (27 August 2007). "PRISM – a new lobby against open access". Science Blogs. Archived from the original on 22 October 2013. Retrieved 17 October 2013. ^ Basken, Paul (5 January 2012). "Science-Journal Publishers Take Fight Against Open-Access Policies to Congress". The Chronicle of Higher Education. Archived from the original on 17 October 2013. Retrieved 17 October 2013. ^ Albanese, Andrew (15 February 2013). "Publishers Blast New Open Access Bill, FASTR". Publishers Weekly. Archived from the original on 17 October 2013. Retrieved 17 October 2013. ^ "Browse by Policymaker Type". ROARMAP. Retrieved 5 March 2019. ^ "The Life and Death of an Open Access Journal: Q&A with Librarian Marcus Banks". 2015-03-31. , "As the BOAI text expressed it, “the overall costs of providing open access to this literature are far lower than the costs of traditional forms of dissemination.”"
^ "Gold open access in practice: How will universities respond to the rising total cost of publication?". ^ "Reasoning and Interest: Clustering Open Access - LePublikateur". LePublikateur. 2018-06-04. Retrieved 2018-06-05. ^ Tennant, Jonathan P.; Waldner, François; Jacques, Damien C.; Masuzzo, Paola; Collister, Lauren B.; Hartgerink, Chris. H. J. (2016-09-21). "The academic, economic and societal impacts of Open Access: an evidence-based review". F1000Research. 5: 632. doi:10.12688/f1000research.8460.3. PMC 4837983. PMID 27158456. ^ Sivaraj, S., et al. 2008. "Resource Sharing among Engineering College Libraries in Tamil Nadu in a Networking System" Archived 2012-12-24 at the Wayback Machine. Library Philosophy and Practice. ^ "Developing World Access to Leading Research" Archived 2013-12-01 at the Wayback Machine. research4life.org. Retrieved on 2012-11-19. ^ Van Orsdel, Lee C. & Born, Kathleen. 2005. "Library Journal". Archived from the original on 2017-06-30. Retrieved 2017-10-18. "Periodicals Price Survey 2005: Choosing Sides"] Library Journal, 15 April 2005. Retrieved on 2012-11-19. ^ Hardisty, David J.; Haaga, David A.F. (2008). "Diffusion of Treatment Research: Does Open Access Matter?" (PDF). Journal of Clinical Psychology. 64 (7): 821–839. CiteSeerX 10.1.1.487.5198. doi:10.1002/jclp.20492. PMID 18425790. Archived (PDF) from the original on 2008-05-28. ^ Swan, Alma (2006) The culture of Open Access: researchers’ views and responses Archived 2012-05-22 at the Wayback Machine. In: Neil Jacobs (Ed.) Open access: key strategic, technical and economic aspects, Chandos. ^ a b Eysenbach, G. (2006). "Citation Advantage of Open Access Articles". PLoS Biology. 4 (5): e157. doi:10.1371/journal.pbio.0040157. PMC 1459247. PMID 16683865. ^ a b Björk, Bo-Christer; Solomon, David (2012). "Open access versus subscription journals: A comparison of scientific impact". BMC Medicine. 10: 73. doi:10.1186/1741-7015-10-73. PMC 3398850. PMID 22805105. ^ Online or Invisible? Steve Lawrence; NEC Research Institute Archived 2007-03-16 at the Wayback Machine. Citeseer.ist.psu.edu. Retrieved on 2011-12-03. ^ a b Davis, P. M; Lewenstein, B. V; Simon, D. H; Booth, J. G; Connolly, M. J L (2008). "Open access publishing, article downloads, and citations: randomised controlled trial". BMJ. 337: a568. doi:10.1136/bmj.a568. PMC 2492576. PMID 18669565. ^ Davis, P. M. (2011). "Open access, readership, citations: a randomized controlled trial of scientific journal publishing". The FASEB Journal. 25 (7): 2129–34. doi:10.1096/fj.11-183988. PMID 21450907. ^ Effect of OA on citation impact: a bibliography of studies Archived 2017-11-02 at the Wayback Machine. Opcit.eprints.org. Retrieved on 2011-12-03. ^ Gaulé, P.; Maystre, N. (2011). "Getting cited: Does open access help?". Research Policy (Submitted manuscript). 40 (10): 1332–1338. doi:10.1016/j.respol.2011.05.025. ^ a b Gargouri, Yassine; Hajjem, Chawki; Larivière, Vincent; Gingras, Yves; Carr, Les; Brody, Tim; Harnad, Stevan; Futrelle, Robert P. (18 October 2010). Futrelle, Robert P (ed.). "Self-selected or mandated, open access increases citation impact for higher quality research". PLOS One. 5 (10): e13636. arXiv:1001.0361. Bibcode:2010PLoSO...513636G. doi:10.1371/journal.pone.0013636. PMC 2956678. PMID 20976155. ^ Teplitskiy, M.; Lu, G.; Duede, E. (2016). "Amplifying the impact of open access: Wikipedia and the diffusion of science". Journal of the Association for Information Science and Technology. 68 (9): 2116. arXiv:1506.07608. doi:10.1002/asi.23687. ^ Maximising the Return on the UK's Public Investment in Research – Open Access Archivangelism Archived 2017-07-02 at the Wayback Machine. Openaccess.eprints.org (2005-09-14). Retrieved on 2011-12-03. ^ Gentil-Beccot, Anne; Mele, Salvatore; Brooks, Travis (2009). "Citing and Reading Behaviours in High-Energy Physics. How a Community Stopped Worrying about Journals and Learned to Love Repositories". arXiv:0906.5418 [cs.DL]. ^ Committee on Electronic Information and Communication (CEIC) of the International Mathematical Union (15 May 2001). "Call to All Mathematicians". Archived from the original on 7 June 2011. ^ "DFID Research: DFID's Policy Opens up a World of Global Research". dfid.gov.uk. Archived from the original on 2013-01-03. ^ How To Integrate University and Funder Open Access Mandates Archived 2008-03-16 at the Wayback Machine. Openaccess.eprints.org (2008-03-02). Retrieved on 2011-12-03. ^ Libbenga, Jan. (2005-05-11) Dutch academics declare research free-for-all Archived 2017-07-15 at the Wayback Machine. Theregister.co.uk. Retrieved on 2011-12-03. ^ Portal NARCIS. Narcis.info. Retrieved on 2011-12-03. ^ "Open and closed access scholarly publications in NARCIS per year of publication". NARCIS. Retrieved 26 February 2019. ^ "Coalition of Open Access Policy Institutions (COAPI) – SPARC". arl.org. Archived from the original on 2015-10-18. Retrieved 2015-10-20. ^ "Good practices for university open-access policies". Harvard. Archived from the original on 5 October 2016. Retrieved 4 October 2016. ^ Baldwin, Julie; Pinfield, Stephen (13 July 2018). "The UK Scholarly Communication Licence: Attempting to Cut through the Gordian Knot of the Complexities of Funder Mandates, Publisher Embargoes and Researcher Caution in Achieving Open Access". Publications. 6 (3): 31. doi:10.3390/publications6030031. ^ "About the AOASG". Australian Open Access Support Group. 2013-02-05. Archived from the original on 2014-12-20. ^ Officer, Executive (2015-08-17). "Australian Open Access Support Group expands to become Australasian Open Access Support Group". Archived from the original on 2015-11-17. Retrieved 2015-11-15. ^ "Creative Commons Australia partners with Australasian Open Access Strategy Group". Creative Commons Australia. 2016-08-31. ^ Suber, Peter (2003). "Removing the Barriers to Research: An Introduction to Open Access for Librarians". College & Research Libraries News. 62 (2): 92–94, 113. ^ "IFLA Statement on Open Access". IFLA. Retrieved 5 March 2019. ^ Scholarly Publishing and Academic Resources Coalition Archived 2013-08-15 at the Wayback Machine. Arl.org. Retrieved on 2011-12-03. ^ Open Access for Scholarly Publishing Archived 2014-05-19 at the Wayback Machine. Southern Cross University Library. Retrieved on 2014-03-14. ^ CARL – Institutional Repositories Program Archived 2013-06-07 at the Wayback Machine. Carl-abrc.ca. Retrieved on 2013-06-12. ^ Suber, Peter (April 3, 2008). "More on libraries as OA publishers". Open Access News. Archived from the original on 2011-06-05. ^ Hahn, Karla. "Research Library Publishing Services: New Options for University Publishing" (PDF). Association of Research Libraries. Association of Research Libraries. Archived (PDF) from the original on 21 September 2013. Retrieved 9 July 2013. ^ Kopfstein, Janus (2013-03-13). "Aaron Swartz to receive posthumous 'Freedom of Information' award for open access advocacy". The Verge. Archived from the original on 2013-03-15. Retrieved 2013-03-24. ^ "James Madison Award". Ala.org. 2013-01-17. Archived from the original on 2013-03-22. Retrieved 2013-03-24. ^ [%= data.comment.created_on %] (2013-03-26). "Entire library journal editorial board resigns, citing 'crisis of conscience' after death of Aaron Swartz". The Verge. Archived from the original on 2013-12-31. Retrieved 2014-01-01. ^ "Journal's Editorial Board Resigns in Protest of Publisher's Policy Toward Authors – Wired Campus – Blogs – The Chronicle of Higher Education". Chronicle.com. 2013-03-26. Archived from the original on 2014-01-08. Retrieved 2014-01-01. ^ "It was just days after Aaron Swartz' death, and I was having a crisis of conscience about publishing in a journal that was not open access". Chrisbourg.wordpress.com. 2013-03-23. Archived from the original on 2014-08-24. Retrieved 2014-08-09. ^ Poynder, Richard (2009) Open and Shut 2009 (3) "The Open Access Interviews: Hélène Bosc" (PDF). Archived (PDF) from the original on 2013-10-23. Retrieved 2013-09-06. ^ Open Access to scientific communication. Open-access.infodocs.eu. Retrieved on 2011-12-03. ^ ATA | The Alliance for Taxpayer Access Archived 2007-09-27 at the Wayback Machine. Taxpayeraccess.org (2011-10-29). Retrieved on 2011-12-03. ^ Open Access: Basics and Benefits. Eprints.rclis.org. Retrieved on 2011-12-03. ^ Eysenbach, Gunther (2006). "The Open Access Advantage". J Med Internet Res. 8 (2): e8. doi:10.2196/jmir.8.2.e8. PMC 1550699. PMID 16867971. ^ Davis, P. M. (2010). "Does Open Access Lead to Increased Readership and Citations? A Randomized Controlled Trial of Articles Published in APS Journals". The Physiologist. 53: 197–201. Archived from the original on December 7, 2010. ^ Goodman, D (2004). "The Criteria for Open Access". Serials Review. 30 (4): 258–270. doi:10.1016/j.serrev.2004.09.009. hdl:10760/6167. ^ Scientific Electronic Library Online Archived 2005-08-31 at the Wayback Machine. SciELO. Retrieved on 2011-12-03. ^ Pearce, J. M. (2012). "The case for open source appropriate technology". Environment, Development and Sustainability. 14 (3): 425–431. doi:10.1007/s10668-012-9337-9. ^ A. J. Buitenhuis, et al., "Open Design-Based Strategies to Enhance Appropriate Technology Development", Proceedings of the 14th Annual National Collegiate Inventors and Innovators Alliance Conference : Open, March 25–27th 2010, pp.1–12. ^ Gilbert, Natasha (15 June 2009). "Editor will quit over hoax paper". Nature. doi:10.1038/news.2009.571. ^ Bohannon, John (4 October 2013). "Who's afraid of peer review?". Science. 342 (6154): 60–65. doi:10.1126/science.342.6154.60. PMID 24092725. ^ Eve, Martin (3 October 2013). "What's "open" got to do with it?". Martin Eve. Retrieved 7 October 2013. ^ Michael, Eisen (3 October 2013). "I confess, I wrote the Arsenic DNA paper to expose flaws in peer-review at subscription-based journals". it is NOT junk. Retrieved 7 October 2013. ^ Vogel, Gretchen (January 14, 2011). "Quandary: Scientists Prefer Reading Over Publishing 'open-access' Papers". Science. Retrieved 2012-11-13. ^ Editors, on behalf of the PLOS Medicine; Peiperl, Larry (2018-04-16). "Preprints in medical research: Progress and principles". PLOS Medicine. 15 (4): e1002563. doi:10.1371/journal.pmed.1002563. ISSN 1549-1676. PMC 5901682. PMID 29659580. ^ Elmore, Susan A. (2018). "Preprints: What Role do These Have in Communicating Scientific Results?". Toxicologic Pathology. 46 (4): 364–365. doi:10.1177/0192623318767322. PMC 5999550. PMID 29628000. ^ "A List of Preprint Servers". Research Preprints. 2017-03-09. Retrieved 2019-03-10. ^ Eve, Martin (2014). Open access and the humanities. Cambridge: Cambridge University Press. pp. 9–10. ISBN 9781107484016. ^ Harnad, S. 2007. "The Green Road to Open Access: A Leveraged Transition" Archived 2010-03-12 at the Wayback Machine. In: ''The Culture of Periodicals from the Perspective of the Electronic Age'', pp. 99–105, L'Harmattan. Retrieved 2011-12-03. ^ Harnad, S.; Brody, T.; Vallières, F. O.; Carr, L.; Hitchcock, S.; Gingras, Y.; Oppenheim, C.; Stamerjohanns, H.; Hilf, E. R. (2004). "The Access/Impact Problem and the Green and Gold Roads to Open Access". Serials Review. 30 (4): 310–314. doi:10.1016/j.serrev.2004.09.013. ^ Fortier, Rose; James, Heather G.; Jermé, Martha G.; Berge, Patricia; Del Toro, Rosemary (14 May 2015). "Demystifying Open Access Workshop". [email protected]. [email protected] Archived from the original on 18 May 2015. Retrieved 18 May 2015. ^ " SPARC Europe – Embargo Periods Archived 2015-11-18 at the Wayback Machine. Retrieved on 2015-10-18. ^ Ann Shumelda Okerson and James J. O'Donnell (eds). 1995. "Scholarly Journals at the Crossroads: A Subversive Proposal for Electronic Publishing" Archived 2012-09-12 at the Wayback Machine. Association of Research Libraries. Retrieved on 2011-12-03. ^ Poynder, Richard. 2004. "Poynder On Point: Ten Years After" Archived 2011-09-26 at the Wayback Machine. Information Today, 21(9), October 2004. Retrieved on 2011-12-03. ^ Harnad, S. 2007. "Re: when did the Open Access movement "officially" begin" Archived 2016-09-13 at the Wayback Machine. American Scientist Open Access Forum, 27 June 2007. Retrieved on 2011-12-03. ^ SHERPA/RoMEO – Publisher copyright policies & self-archiving Archived 2007-11-11 at the Wayback Machine. Sherpa.ac.uk. Retrieved on 2011-12-03. ^ "Evaluating Institutional Repository Deployment in American Academe Since Early 2005: Repositories by the Numbers, Part 2". www.dlib.org. Retrieved 2019-03-10. ^ Dawson, Patricia H.; Yang, Sharon Q. (2016-10-01). "Institutional Repositories, Open Access and Copyright: What Are the Practices and Implications?". Science & Technology Libraries. 35 (4): 279–294. doi:10.1080/0194262X.2016.1224994. ISSN 0194-262X. Suber, Peter (2012). Open access (The MIT Press Essential Knowledge Series ed.). Cambridge, Mass. : MIT Press. ISBN 978-0-262-51763-8. Retrieved 2015-10-20. Laakso, Mikael; Welling, Patrik; Bukvova, Helena; Nyman, Linus; Björk, Bo-Christer; Hedlund, Turid (2011). "The Development of Open Access Journal Publishing from 1993 to 2009". PLoS ONE. 6 (6): e20961. Bibcode:2011PLoSO...620961L. doi:10.1371/journal.pone.0020961. PMC 3113847. PMID 21695139. Hajjem, C.; Harnad, S; Gingras, Y. (2005). "Ten-Year Cross-Disciplinary Comparison of the Growth of Open Access and How It Increases Research Citation Impact". IEEE Data Engineering Bulletin. 28 (4): 39–47. Bibcode:2006cs........6079H. Tötösy; de Zepetnek, S.; Joshua, Jia (2014). "Electronic Journals, Prestige, and the Economics of Academic Journal Publishing". CLCWeb: Comparative Literature and Culture. 16 (1): 2014. doi:10.7771/1481-4374.2426. Okerson, Ann; O'Donnell, James (Eds.) (June 1995). Scholarly Journals at the Crossroads: A Subversive Proposal for Electronic Publishing. Washington, DC: Association of Research Libraries. ISBN 978-0-918006-26-4. CS1 maint: Extra text: authors list (link). Wikimedia Commons has media related to Open access (publishing). OAD: Open Access Directory, an "open-access, wiki-based, community-updated encyclopedia of OA factual lists" (started by Peter Suber and Robin Peek). OCLC 757073363. Published by Simmons School of Library and Information Science in US.